The story behind the classic Christmas Carol "Silent Night"
In 1818, a roving band of actors was performing in towns throughout the Austrian Alps. On December 23 they arrived at Oberndorf, a village near Salzburg where they were to re-enact the story of Christ's birth in the small Church of St. Nicholas. Unfortunately, the St. Nicholas' church organ wasn't working and would not be repaired before Christmas. (Note: some versions of the story point to mice as the problem; others say rust was the culprit) Because the church organ was out of commission, the actors presented their Christmas drama in a private home. That Christmas presentation of the events in the first chapters of Matthew and Luke put assistant pastor Josef Mohr in a meditative mood. Instead of walking straight to his house that night, Mohr took a longer way home. The longer path took him up over a hill overlooking the village. From that hilltop, Mohr looked down on the peaceful snow-covered village. Reveling in majestic silence of the wintry night, Mohr gazed down at the Christmas-card like scene. His thoughts about the Christmas play he had just seen made him remember a poem he had written a couple of years before. That poem was about the night when angels announced the birth of the long-awaited Messiah to shepherds on a hillside. Mohr decided those words might make a good carol for his congregation the following evening at their Christmas eve service. The one problem was that he didn't have any music to which that poem could be sung. So, the next day Mohr went to see the church organist, Franz Xaver Gruber. Gruber only had a few hours to come up with a melody which could be sung with a guitar. However, by that evening, Gruber had managed to compose a musical setting for the poem. It no longer mattered to Mohr and Gruber that their church organ was inoperable. They now had a Christmas carol that could be sung without that organ. 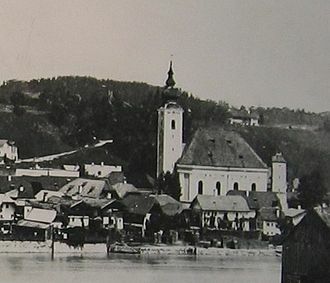 Weeks later, well-known organ builder Karl Mauracher arrived in Oberndorf to fix the organ in St. Nicholas church. When Mauracher finished, he stepped back to let Gruber test the instrument. When Gruber sat down, his fingers began playing the simple melody he had written for Mohr's Christmas poem. Deeply impressed, Mauracher took copies of the music and words of "Silent Night" back to his own Alpine village, Kapfing. There, two well-known families of singers — the Rainers and the Strassers — heard it. Captivated by "Silent Night," both groups put the new song into their Christmas season repertoire. 'Round yon virgin mother and Child! The Strasser sisters spread the carol across northern Europe. In 1834, they performed "Silent Night" for King Frederick William IV of Prussia. He then ordered his cathedral choir to sing it every Christmas eve. Twenty years after "Silent Night" was written, the Rainers brought the song to the United States, singing it in German of New York City's Trinity Church. In 1863, nearly fifty years after being first sung in German, "Silent Night" was translated into English by either Jane Campbell or John Young. Eight years later, that English version made its way into print in Charles Hutchins' Sunday School Hymnal. Today the words of "Silent Night" are sung around the world in in more than 300 different languages. For a copy of the song as originally written by Mohr and Gruber, click here. Want to sing "Silent Night" in another language? Words to "Silent Night" in more than 100 languages, including Italian and Spanish click here. Each year on December 24th at 5 pm Central Europe Time, Oberndorf near Salzburg (Austria) honors the two creators of the carol "Silent Night", Franz Xaver Gruber and Joseph Mohr. This celebration - audio inclusive - is broadcast live by webcam.